In Jefferson's quest to adapt the designs of the influential 14th century Italian architect Andréa Palladio (1508-1580) to the climate of Virginia he developed a method for building approximately flat roofs. These roofs were similar in appearance to those found in several of Palladio’s designs as well as on the neo-Palladian houses built by mid to late 18th century English architects. Jefferson's solution, which he may have seen during his travels in France, was called a "terras" roof. These roofs used a simplified framing system based on an alternating arrangement of elevated and recessed canted joists that created a series of peaks and valleys. 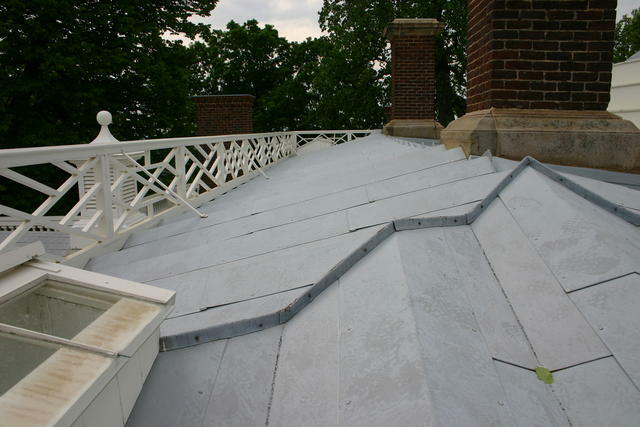 The restored terras roof at Monticello in Albemarle County, VA.